So it's come to this. 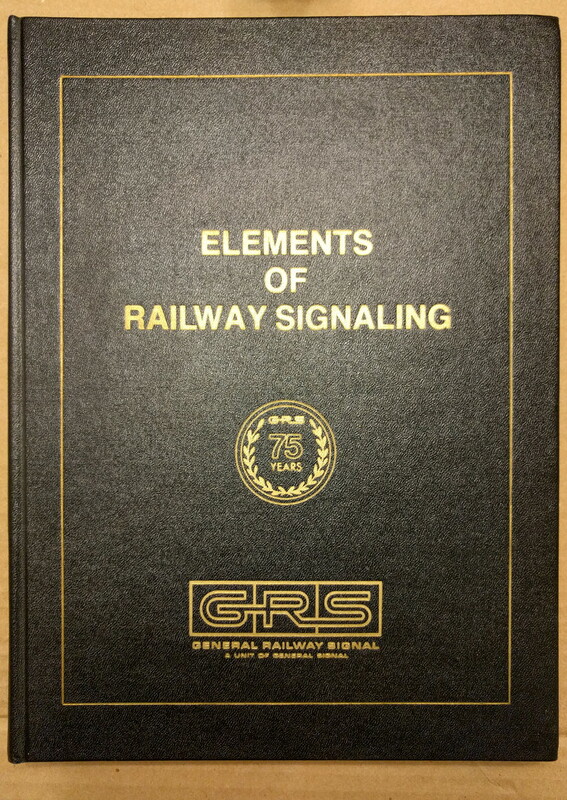 I'm so desperate for filler content that I've taken a page from the Forgotten Weapons playbook and started posting book reviews 😂 General Railway Signal's (GRS) Elements of Railway Signaling (or at least this version) was published in 1979, on the 75th anniversary of the companies consolidation. It is an industrialreference book similar to Babcock and Wilcox's "Steam: It's Generation and Use" and is likely targeted at electrical engineers who are looking to enter the railway signaling field or at least manage it. No publisher information is listed and it appears to have no ISBN. 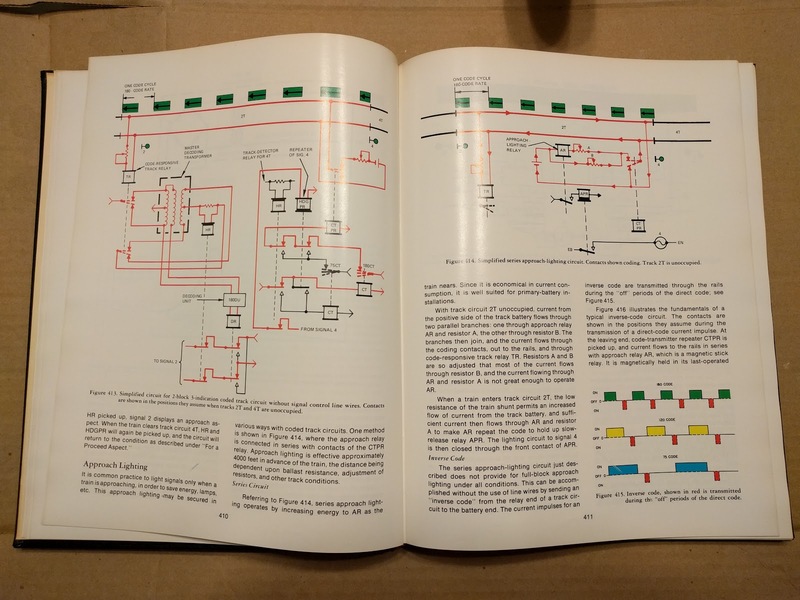 The book is exceedingly comprehensive, covering everything from basic track circuits to CTC systems and NX interlocking schemes. It also covers all sorts of obscure topics like approach lighting and hump yard retarder systems. When one reads the word "Basics" in a title, one might expect a focus on "basic" operations. Big easy to read diagrams of Automatic Block schemes and grade crossings. 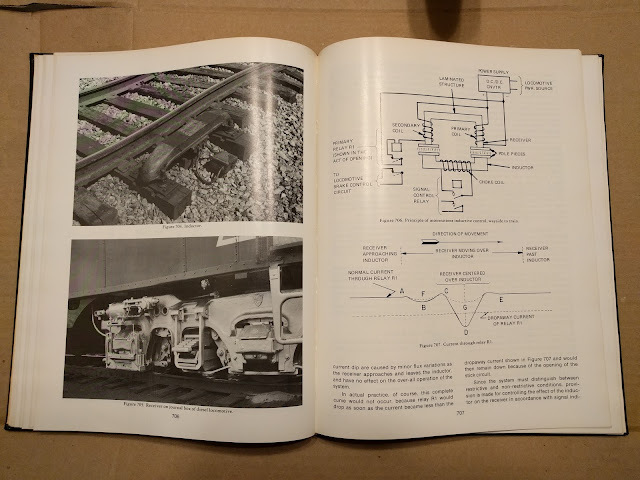 This book is more an inch deep and a mile wide, providing a basic explanation of pretty much every railroad signaling topic. Ultimately this is where the book can fail a reader with no or only casual electrical engineering experience (and no, not the digital kind that everybody is learning today). For pretty much every signaling topic one can think of, the book provides a paragraph or two, a diagram and then moves on to the next topic. There has been very little effort given to actually trying to provide intuitive explanations and a lay reader will probably need to make more than a few passes. Ultimately a reader will gain insight into why (classic) signaling works the way it does, however there are so many ways to do similar things that without further information one will not be able to tell how any specific piece of railroad is signaled. Moreover, with a date of 1979, there are a lot of things that are not covered like solid state relay replacements and data transmission that uses packets instead of simple frequencies and polarities. Still, it's a very valuable reference for anyone who is looking to understand how things worked in the pre-digital age and Railway Signaling is far more accessible than something like Color Television or Telephone Switches. After all, relays are pretty much digital devices. Because of it's "not really published" status, the book is hard to find at typical online booksellers. Ebay is your best bet with final sales prices ranging between $20 and $30 before shipping. These books also can be found at train shows with a typical price of $40.